Last week I drove down to Omaha to visit my brother and sister-in-law, Mic and Morgan. I had a FANTASTIC time. The ride there and back was enlivened by listening to my Kindle read me a great fluff YA book, Tempest Revealed. It’s the third in a series about a girl named Tempest who discovers she’s a mermaid and is torn between her human boyfriend and a handsome selkie prince. But I digress. When I arrived in Omaha, it was in the forties!! It hasn’t been that warm here for weeks!! Mic took me to a few of the places he’s picked up work over the past few months (doing prescribed burns and now ski instructing) and then we checked out some local shops downtown. The most beautiful was Mangelsen Photography; he has some stunning images from around the West, and Mic used his panoramas of the Tetons to show me which mountain was which! Afterwards, Morgan joined us at Blue Sushi for supper. Aren’t they cute?!! That’s our giant selection of tasty sushi in the foreground! Then Mic made us some super-tasty “special” hot chocolate for dessert, and I captured this Christmas-card worthy shot of the family, including their kitty Otto. Mic also regaled me with exciting tales from his fire season adventures. The next morning, Mic and I had a delicious breakfast (wildberry stuffed French toast, yum!) at Lisa’s Radial Cafe. Crispy bacon, scrumptious French bread, hashbrowns, and bottomless coffee… Then Mic and I hit up the mall, the Memorial, and the Joslyn Art Museum. Here we are in front of a eye-boggling sculpture. The Joslyn has several stunning works by Thomas Moran, a painter who worked up in the Tetons (actually one of the mountains is named after him!). Between Mic, Moran and Mangelsen, I think God is encouraging me to visit Wyoming. I can’t believe there’s only 4 days til Christmas. This month has flown by. I will miss being with family this year but I am so thankful for them. I am so glad I got to visit Mic and Morgan and saw Chris’s side of the family in November, and I am looking forward to seeing my family in Colorado in January. 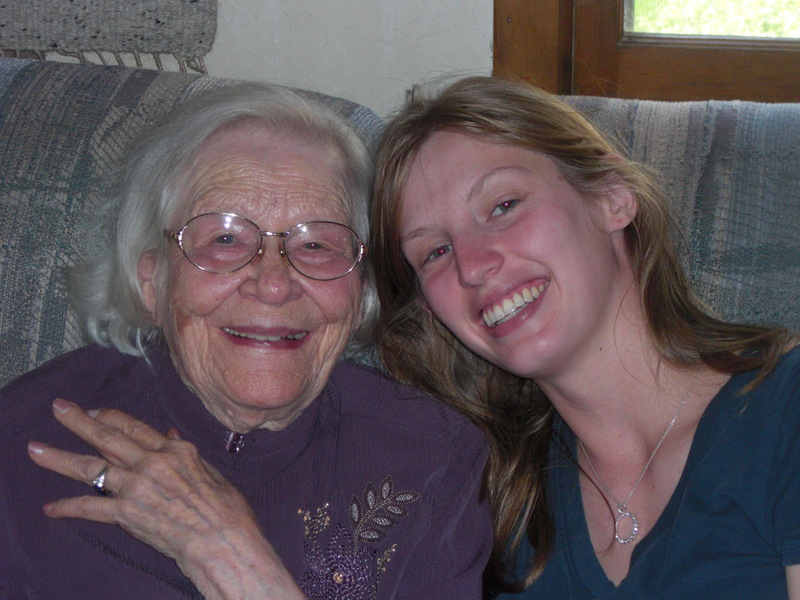 To close on a serious yet joyful note… my grand-grandmother passed away recently. Although I will miss her, I am glad she is with Jesus. “And God shall wipe away all tears from their eyes, and there shall be no more death, neither sorrow, nor crying, neither shall there be any more pain; for the former things are passed away” (Rev. 21:4). Here is a picture of us together 4 years ago. This entry was posted in Travel and tagged Blue Sushi, Gram, Jackson, Joslyn Art Museum, Kindle, Moran, Omaha, Radial Cafe, Tempest Revealed. Bookmark the permalink.